We've found 16 research news articles and events relevant to the field of humanlike conversational artificial intelligence. Summary: Basing on "regret" algorythm, computers are able to optimize experienced emotions. Researchers from Blavatnik School of Computer Science at Tel Aviv University led by Professor Yishay Mansour are developing artificial intelligence algorithm in order to equip machines with human emotions. According to this algorithm based on machine learning, the computer programs are taught a sense of “regret” and how to “feel sorry” for their mistakes. Chatbots.org 2.7: The Academic Research Section is there! Chatbots.org launches the largest specialized research area on humanlike conversational artificial intelligence in its new 2.7 release on http://www.chatbots.org/research. We have worked on it for over 18 months, and we are very excited to present the result today: 1,031 academic journals, more than 13,000 universities, 163 books, 327 annual academic events, 475 publishers and loads of academic papers. And the best is: from a content point of view, this is just the start! This area is expected to grow very fast. We believe that the academic community will benefit greatly from this area. They will get in touch with businesses to set up commercially funded projects, attract talent by profiling themselves in our new university ranking and align themselves with innovative entrepreneurs. This article will demonstrate what to expect from our new research section; how it all fits into the Chatbots.org scope and where it is heading to. 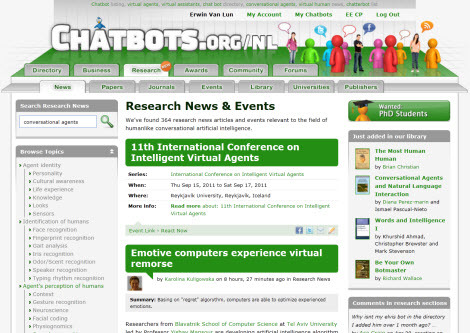 Read more about: Chatbots.org 2.7: The Academic Research Section is there!